A group of Dyers from Georgia, Alabama and Florida journeyed to the Capitol on May 31 to meet with Governor Sonny Perdue for official recognition of their ancestor, Micajah Clark Dyer, who invented a "flying machine" in the North Georgia mountains more than two decades before the Wright brothers' flight at Kitty Hawk, N.C., in 1903. The Governor signed H.R. 413, which incorporated H.R. 1236 introduced by Rep. Charles Jenkins and approved by the Legislature during its recent session, to name a portion of State Hwy. 180, located about 8 miles south of Blairsville, Ga., the Micajah Clark Dyer Parkway. The youngest descendent present at the Governor's office was 10-month-old James Micajah Cooper, a great-great-greatgreat grandson of the inventor (pictured above). His parents are Joseph and Sarah Coker Cooper, and his grandparents are David and Geraldine Dyer Coker. 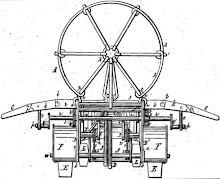 Although the U.S. Patent Office granted Dyer a patent for his machine on September 1, 1874, it was only a little over a year ago that the family finally located the patent and authenticated the legend that has been handed down through generations about the airplane Dyer invented and flew off Rattlesnake Mountain in Union County. According to oral history, after Dyer's death in 1891 his widow sold the plans and specifications for the aircraft to two Redwine brothers in Atlanta, who later sold them to Orville and Wilbur Wright. It is probable that the Wrights incorporated Dyer's design into their plane and received credit for the first flight. Following discovery of Dyer's patent, word has spread about his sophisticated drawings and descriptions crafted at this early time in history and his important contribution to the advancement of aviation. The Curator of the Georgia Aviation Hall of Fame at the Museum of Aviation located at the Air Force Base in Warner Robins, Ga., is planning to include Micajah Clark Dyer in the celebration of Georgia's 100th Anniversary of Flying planned for next April. A dedication ceremony for the Micajah Clark Dyer Parkway is planned for Saturday, July 15, 2006, at 3 p.m. at the Choestoe Baptist Church Life Center, located on Highway 180 a short distance from US Hwy. 19/129, south of Blairsville. The Dyer family is cordially inviting everyone to attend the celebration. Thanks to Union County Representative, the Honorable Charles F. Jenkins, Highway 180 will soon be designated the Micajah Clark Dyer Parkway. 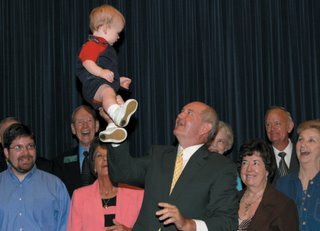 The resolution which has passed the Georgia House and Senate will receive Governor Sonny Perdue’s signature at a ceremony at the state capitol on May 31. Some of the descendants of the Choestoe inventor will be present for the significant signing. 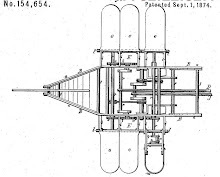 In this column several months ago, you read how the patent for “An Apparatus for Navigating the Air” was registered with the U. S. Patent Office in 1875. In his workshop near Rattlesnake Mountain at Pine Top in Choestoe District, this farmer-turned-inventor labored away to perfect his flying machine. My Uncle Herschel Dyer told of seeing the machine and so did a grandson of Micajah Clark Dyer, John Wimpey. His plans for the apparatus were drawn to scale and his description of how to build the machine read like those of a well-educated engineer. For years “Clark Dyer and His Flying Machine” were treated like legend, a story passed from generation to generation for the purpose of claiming some glory from one who had gone before. It has been said that this genius of the mountains secluded himself to work as much as possible on his plans for an airplane. As a recluse, he was considered somewhat eccentric and “different” from his neighbors. He lived from 1822 through 1891, and got his airship to lift from a take-off runway he had built on the mountain, aiming the vehicle to his cleared field. He died before he had perfected the flying machine. His plans were sold to the Redwine Brothers of Atlanta. It is believed that this company turned the plans over to the Wright Brothers of Kitty Hawk fame, who launched their plane on December 17, 1903. The scene at Kill Devil Hill on that windy December day in 1903 has been noted as America’s initiation into the flight age. Powered by a twelve horse-power engine, the Wright’s plane weighed 745 pounds. Although the four trials on the day of its launch were short, the longest being 852 feet in 59 seconds, according to Orville Wright’s journal, “The machine started off with its ups and downs, but by the time he (Will) had gone over three or four hundred feet, he had it under much better control, and was traveling on a fairly even course.” The day’s trial runs and the brisk wind caused the plane to be so broken up that the Wright brothers had to do much mending and improving before their next trial run. Nowadays, we take air and even space travel for granted. But thinking back on some aspects of flight history, it is amazing that by 1927, twenty-four years after the Wright brothers’ initial flight, and fifty-two years after Micajah Clark Dyer received the patent for his “Apparatus for Navigating the Air,” Charles Augustus Lindbergh had flown solo over the Atlantic Ocean from New York to Paris. Lindbergh was an airmail pilot between St. Louis, Missouri and Chicago, Illinois. A group of St Louis businessmen pooled money and offered to sponsor the flight. A $25,000 prize was to be offered the pilot who could successfully complete the trans-Atlantic flight. Lindbergh purchased a Ryan monoplane in San Diego, California, and set a trans-continental flight speed record by taking the plane to New York. On May 20, 1927, Lindbergh took off from Roosevelt Field heading east over the Atlantic. The next day, thirty-three and one-half hours later, he set “The Spirit of St. Louis,” as the plane was named, down at Le Bourget airfield outside of Paris, France. An estimated crowd of 100,000 people had gathered outside the fences at Le Bourget, waiting six or seven hours to see the American pilot land. Many doubted that he would complete the trip. Soldiers and guards tried in vain to control the excited crowd. To keep Lindbergh from being crushed in the press, two French aviators, Major Weiss and Sergeant Troyer, rescued him and took him in a Renault car to the commandant’s office across the field. The first Frenchmen to “The Spirit of St. Louis” said, “Cete fois ca va!” (This time it is done!”).